Jensens London Distilled Old Tom Gin is a popular Craft Gin available from DrinkSupermarket.com in 70cl to buy online. Visit DrinkSupermarket.com for the best price for 70cl of Jensens London Distilled Old Tom Gin or compare prices on our other Craft Gin products. Following the success and critical acclaim for Jensen's London Dry Gin, and the recent revival of interest in older style gins, Christian has turned the clock back even further with his new Jensen's London-Distilled Old Tom Gin. Old Tom was an early nickname for gin, and nowadays it is generally understood to refer to the sweeter style of gin produced in the late 1800s and early 1900s - when sugar was added to gin to recreate the flavours of the original Old Tom gins of the late 18th and early 19th centuries. But Old Tom wasn't always artificially sweetened in this way. Jensen's Old Tom is a recreation of an original Old Tom recipe from the 1840s, when sugar was more expensive and impurities were usually hidden by the simple expedient of adding greater quantities of botanicals. Jensen's Old Tom is true to this style, producing an extraordinarily complex, intensely-flavoured gin, with long-lasting herbal spiced notes and a natural residual sweetness on the finish. Jensen's Old Tom Gin is an unmissable taste experience, and is perfect for classic gin cocktails like the Tom Collins or Martinez whose original recipes called for Old Tom. 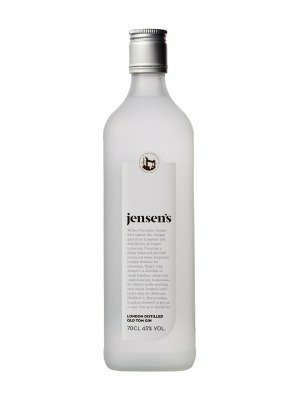 Where to buy Jensens London Distilled Old Tom Gin ? Jensens London Distilled Old Tom Gin Supermarkets & Stockists. You can buy Jensens London Distilled Old Tom Gin online in most retailers and find it in the Craft Gin aisle in supermarkets but we found the best deals online for Jensens London Distilled Old Tom Gin in DrinkSupermarket.com, Amazon.co.uk, TheDrinkShop, and others. Compare the current price of Jensens London Distilled Old Tom Gin in 70cl size in the table of offers below. Simply click on the button to order Jensens London Distilled Old Tom Gin online now.